When you are asked to make evening tiffin without using oil, flour, wheat, idly/dosa batter, sugar etc., you will have no other choice other than vegetables. Thats how I landed in this recipe. I was doing bhel pori before, but turns out pori(puffed rice) is rich in carbs i guess. I saw a programme in a local channel where the chef was making tomato cups for dessert. He was using caramalized pineapple and heavy cream topping and all. 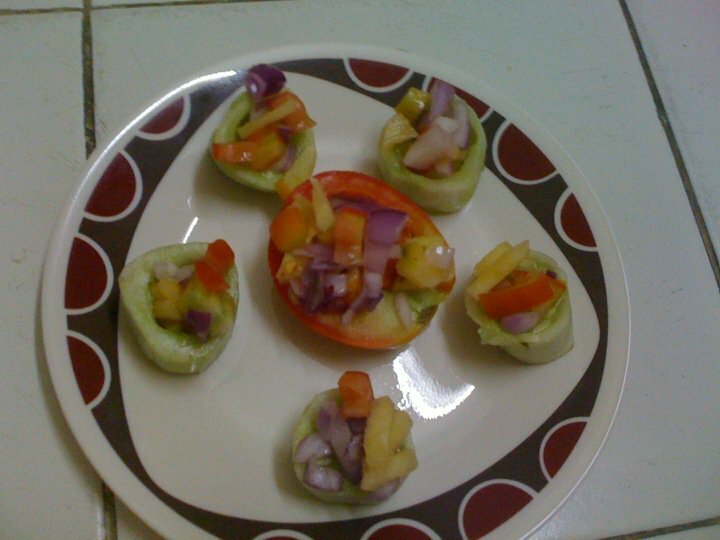 But after watching that programme, I got the idea of making this cucumber cups. Cut cucumber into 3 cms thick. Take out the seeds from inside and sprinkle some salt in it and keep it aside for few minutes. In the mean time, chop tomato, onion, pineapple and coriander leaves and mix everything together adding required amount of salt. 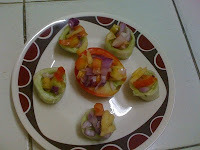 Fill the cucumber cups with the vegetable mix and serve it. We can serve it just like that or with a teaspoon of fat free yogurt on top. I made this for my husband without anything. For myself, i just sprinle couple of kurkure on top of it and it tasted really good. I stuffed the remaining vegetables in tomato also. It also tasted good. If any one of you have any ideas for some healthy evening snack, please let me know. Hey Vidhya, thats really a good idea for evening snack!!!! Wat a cute looking cups, prefect for kids..
looks good! nice healthy snack! with kurkure I m sure the kids will not mind it!